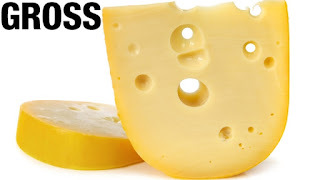 Everyone has a certain food that they don’t like and for me, that food is cheese. I not only dislike the taste of cheese, I hate the look, smell, and feel of the greasy, gooey, godawful stuff. These are days of great tolerance in America. It’s perfectly acceptable to be an atheist, a Communist, in love with someone named “Trigger,” or even a fan of Kevin James. But it doesn’t seem to be OK to hate cheese. It got so bad that last week I landed in a psychiatrist's office. "You What?!!" said Dr. Kropotkin. "You hate cheese?!" "Yes, doctor. My entire life has been an Adventure in Cheese Hating." "So you seek treatment for your perversion? I'm not sure that medical science has advanced far enough!" "Speaking of advancing, doctor, I notice you seem to be advancing closer to the back door." "Oh, the better to ...to ....to hear you, my boy!" "But you're actually farther away from me!" "I'm ...umm .... farsighted, except it's settled in my ears." "Oh, sure. I guess grabbing that letter opener also helps you hear?" "Do you not like any cheese?! Not even Gouda!" "No, for me Gouda is bada!" "But a cheese shop! You must love the smells inside a cheese shop?" "The only cheese shop I like is Monty Python's, because it has no cheese." "Haven't you ever eaten any cheese?!" "Occasionally when I order something that even the wait person doesn't know contains some cheese, like certain soups or salads." "What ... what .... happens then?" "A spit take straight out of the old Danny Thomas Show. I could hit Danny Thomas and he's dead." "I've heard quite enough! You... you ... "
"Gee, now you've grabbed scissors too." "In your disrespect for cheese, sir, you trample on the traditions that form the heritage of America, those of God, family, and morality!" "Oh, I'm sorry, I didn't mean to offend your values. I guess you're a conservative Republican?" "No, no, I'm an anarchist! " "Gee, you're almost out the door now." "Sorry, I can't take a deranged person as a patient! Help! Help! Somebody help me!!!" "What patient, doctor? I just ducked in here to avoid the noxious cheese fumes from the cafe next door." "Oh. Okay, in that case I recommend Total Immersion Therapy." "Immerse yourself any place but here." "And don't ever forget. Gouda is GOOD-A!" If you liked this post, you might also like Out of This World!, One of these Days ... and of course, Fromage-a-phobia. If you hated this post, go gag on some gorgonzola! Holy Swiss, Perry, did you know Gouda is pronounced Howdah? I didn't, but I'm sure I hate both of them. And "Holy Swiss?" That's funny, why didn't I think to use it in the damn piece in the first place?